서명/저자 (The) Transformation of employment relations in Europe : institutions and outcomes in the age of globalization / ed.by James Arrowsmith ; Valeria Pulignano. 발행사항 New York : Routledge Taylor & Francis Group , 2013. Since the 1980s, the process of European economic integration, within a wider context of globalization, has accelerated employment change and placed a new premium on ‘flexible’ forms of work organization. The institutions of employment relations, specifically those concerning collective bargaining between employers and trade unions, have had to adapt accordingly. The Transformation of Employment Relations focuses not just on recent change, but charts the strategic choices that have influenced employment relations and examines these key developments in a comparative perspective. A historical and cross-national analysis of the most important and controversial ‘issues’ explores the motivation of the actors, the implementation of change, and its evolution in a diverse European context. The book highlights the policies and the role played by different institutional and social actors (employers, management, trade unions, professional associations and governments) and assesses the extent to which these policies and roles have had significant effects on outcomes. This comparative analysis of the transformation of work and employment regulation, within the context of a quarter-century timeframe, has not been undertaken in any other book. 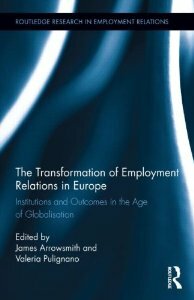 But this is no comparative handbook in which changes are largely described on a country-by-country basis, but instead, The Transformation of Employment Relations is rather focused thematically. As Europe copes with a serious economic crisis, understanding of the dynamics of work transformation has never been more important.